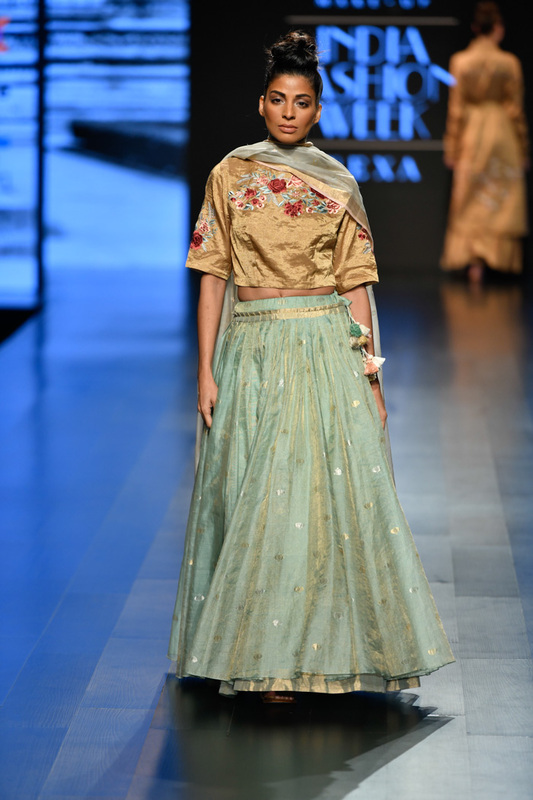 A fusion of Indian and contemporary fashion, day 3 and 4 of Lotus Make Up India Fashion Week 2018, had all the attention on mesmerising details. Presenting some of the most dazzling outfits from day 3 and 4. Huma Qureshi was a vision in a white Manish Malhotra ensemble. A dramatic white jacket with feathered shoulders was the apt oomph factor to her cropped bodice and ruffled skirt. Yami Gautam’s Warp n Weft ornate orange lehenga accessorised with oversized tassel earrings was the wedding trousseau inspiration we needed. The embellished sheer dupatta complemented her look. Architha Narayanam’s latest collection Tha’lassa had Prachi Desai donning a lime green lehenga with a golden tasseled hem. The outfit had beautiful silver sequin detailing all over with a lime green dupatta to accompany. Athiya Shetty was dressed in a Poshpride ensemble. Her exaggerated red ruffled skirt was paired with a V-neck top and further layered with a silver blazer. Striking red and pink embroidery against black fabric, Tabu’s Mekhla Chador saree from Sanjukta Dutta was quite the stunner. The saree had a fringed red hem and tasseled pallu detailing. The beauty of the crafts of chikankari and daraz on handwoven Maheshwari and Jamdani textiles, Rahul Mishra’s collection ‘Gossamer’ was a detailed ready-to-wear paradise. Inspired by India’s rich craft culture and heritage, ‘Sone ki Chidiya’ by Pratima Pandey was a fusion of silver zari chanderis, kadwa techniques, handloom gold and other hand crafted embroideries on handwoven fabrics.